Are you in the midst of summer craziness yet? Here in Berlin, we have the weirdest summer to date. One day it is scalding almost-40°C-hot, the next day we have thunderstorms and taifun-like rain. The temperature climbs and falls from day to day and it is slowly but steadily getting to me. 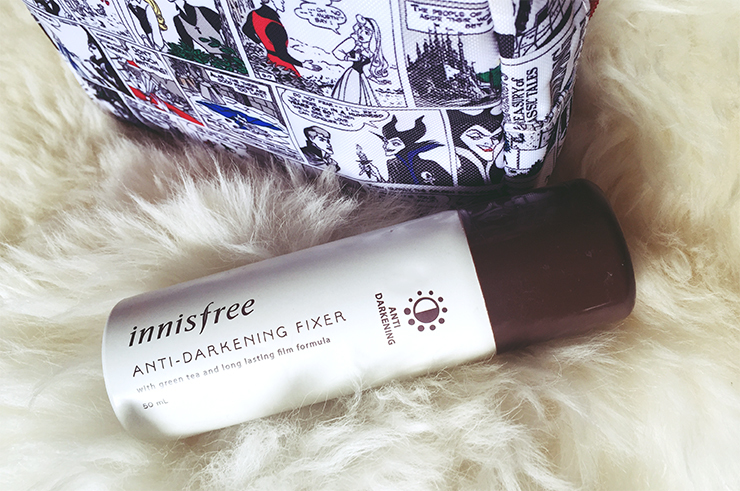 For the hot days however, I have made myself a survival kit that I carry everywhere and one little item that has been a constant companion of mine is the Innisfree Anti-Darkening Fixer. After I discovered my (to this day) favorite foundation, the Luna Water Essence Founpact, I was faced with a challenge I had not considered before: I needed something to prevent the very moisturizing, yet not blessed with the greatest staying abilities, make-up goodness to slide off my face, especially as the temperature rose. Since I couldn't find much online about this (rather new, I think?) product, I decided to request it at Jolse (the ultimate bae) for review purposes to let you know how it worked for me. 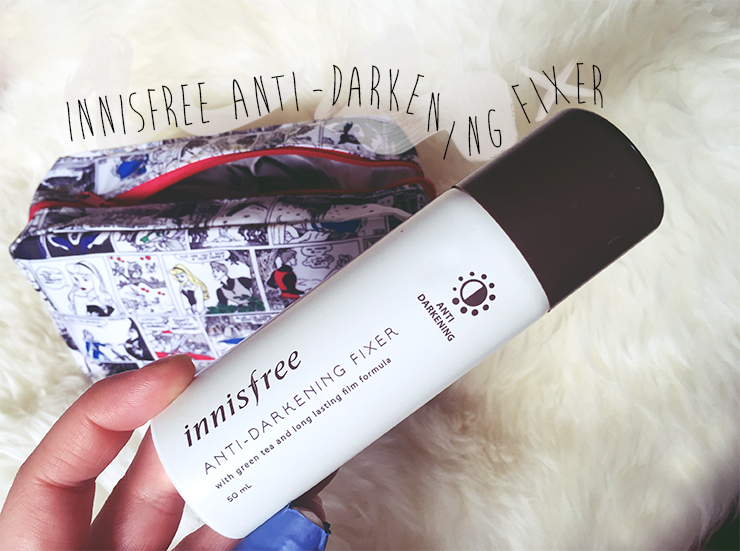 Claims: "A high molecule networking polymer creates a thin fix film on the face for a clear face without darkening. 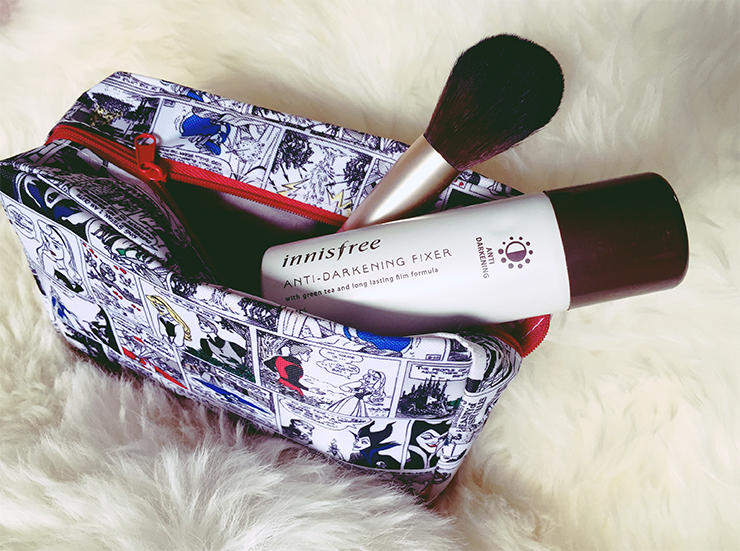 Long lasting film formula enables your makeup last long. Juju green tea extract gives your face moisture immediately." Ingredients: Water, Butylene Glycol, Cyclopentasiloxane, Methyl Methacrylate Crosspolymer, Dimethicone, Squalane, Bis-PEG-18 Methyl Ether Dimethyl Silane, Cyclohexasiloxane, Silica, Hydroxyethyl Acrylate, Polysilicone-11, Glyceryl Stearate, Glyceryl Stearate Citrate, Trimethylsiloxysilicate, Cetearyl Alcohol, Hydrogenated Vegetable Oil, Phenoxyethanol, Stearic Acid, Ammonium Acryloyldimethyltaurate, Palmitic Acid, HDI, Fragrance, Cammelia Sinensis Leaf Extract, Polymethylsilsesquioxane, Ethylhexylglycerin, Xanthan Gum, Disodium EDTA, Orchid Extract, Camellia Japonica Leaf Extract, Citrus Unshiu Peel Extract, Mineral Salts, Opuntia Coccinellifera (Prickly Pear) Fruit Extract, Propanediol, Glycerin, Citrus Aurantium Dulcis (Orange) Fruit Extract, Citrus Paradisi (Grapefruit) Fruit Extract, Citrus Tangerina (Tangerine) Extract. I was a little bit disappointed by the lack of real moisturizing agents, but then I am not sure if hydrating ingredients would probably counteract the "fixing" ability of the spray? Anyways, this spray consists mainly of Glycerin and Water which are actually the main ingredients of many fixing sprays such as the quite expensive MAC Fix Plus. Another main ingredient are silicones which are famous for acting as a "sealed" barrier, but can be problematic for some. I personally would prefer a shorter ingredient list with less potential irritants as the actual formula probably wouldn't suffer too much if you took most of them out. Also, the green tea extract (Camellia Japonica Leaf) seems to be only a miniscule amount but that was honestly expected as this isn't a treatment so it doesn't bother me too much. I have to say it: This is probably the most boring packaging I ever came across in my quest through Asian Beauty. I mean, I get that Innisfree has this earhy-vibe going on but couldn't they at least have picked any other colors for the packaging? The cream-colored spray can looks very muted together with the dark brown accents and cap. I don't mind it but it wouldn't hurt from a marketing perspective if this had a packaging that was at least a bit more appealing. 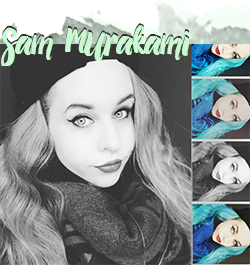 My eyes want to enjoy Asian Beauty too, y'know. What I really like about this spray is that it provides a very fine micro mist, so no matter how much you spray you would need a lot of talent to destroy your make-up by using too much of it. As you can see in the demonstration, you barely see anything so yeah, the mist is really fine which makes it great for using over foundation. I usually spray 2-3 times from an arm's length afar and hold my face into the fine mist. It does feel refreshing and a bit hydrating but not a lot. I do believe that my make-up looks better and a bit more "together" after using this. So does it work? ...yeah, kinda. It is not as effective as some sprays such as the Urban Decay All Night Fixing Spray but my make-up definitely looks a lot better than without it. I also like to use it just as a refreshener when I'm half through my workday as my job is just really stressful. While my make-up does wear off throughout the day (and honestly, I'd be a bit scared if it wouldn't) the overall look stays a lot more fresh and not a lot of transferring is happening. 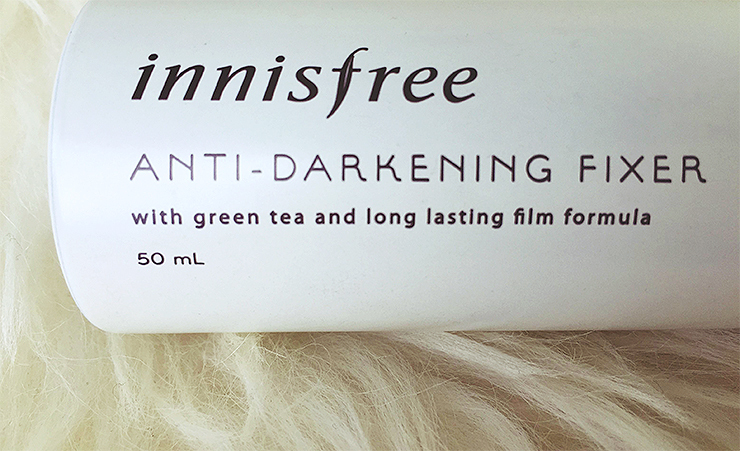 Since this works for me but doesn't necessarily blow me out of the water, I won't repurchase this and try out other similar products instead. If you're interested in trying this, you can get it at Jolse for 13,98$. Disclaimer: This product was kindly sent to me for review purposes upon my request by Jolse. All opinions stated are my own and have not been influenced by a third party.